Welcome to the 2016 Firecracker Baseball Tournament! We are pleased to have you as our guest and look forward to making your stay enjoyable and memorable. With a thriving arts district, a commitment to historical preservation, and a sophisticated nightlife, Providence offers a variety of entertainment options. The Federal Hill neighborhood is brimming with restaurants, galleries, and specialty stores. Our Tony award-winning Trinity Repertory Company draws throngs of theatergoers into the city. The Museum at the Rhode Island School of Design houses a diverse, world-class art collection. 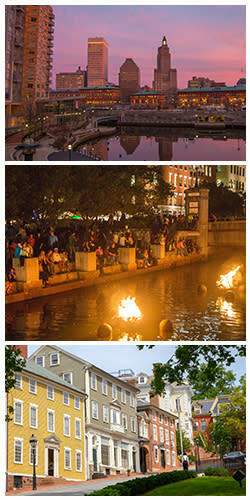 One of Providence&apos;s most popular cultural events is WaterFire, a multi-sensory art installation, highlighted by a series of bonfires installed on the three rivers of downtown Providence. Nearby Warwick has more than 39 miles of breathtaking coastline, including beaches. There&apos;s plenty here to attract the eye of the most discerning shopper. Connected to the Rhode Island Convention Center and Omni Providence, Providence Place Mall offers more than 100 shopping, dining, and entertainment options. Funky urban chic can be found at the many boutiques on Thayer and Wickenden streets, as well as Wayland Square. Warwick is Rhode Island&apos;s retail capital, with a 5.3 mile stretch of road containing more than 250 stores, from retail giants to specialty shops. With so much to do and see, we are sure that your visit with us will be a memorable one. Enjoy your stay in Providence!